It's also 50 percent off on Steam. Goofy physics puzzler Human: Fall Flat, which is now almost three years old despite the fact that I could swear it only came out the other day, has converted a lot of people to a life of commanding wobbly homunculi in an effort to solve elaborate puzzles. On Monday, developer Curve Digital celebrated the 5 million sales milestone. To mark that, and the Chinese New Year, Human Fall Flat players are getting free stuff. Human: Fall Flat is 50 percent off for Steam's Lunar New Years Sale, making it a mere £6/$7.49. Along with the discount, four new—ever so slightly terrifying—skins have been flung into the mix, and everyone gets them for free. There's a rodeo clown, a cowboy, a hiker and a crime against nature that crams three entire pigs into one skin. There's a snout where you'd normally expect an arse. Jesus. It's the first of many content drops happening this year, says the developer. 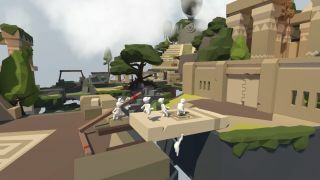 If you're just starting out, Samuel Horti collected a bunch of his favourite solutions to Human: Fall Flat's ridiculous physics puzzles, so give that a read. In 2017, multiplayer was also introduced, so you can collaborate with your fellow Jelly Babies to solve puzzles or, presumably, get in their way. At the very least, expect a bit more chaos. The new skins are available now.